GPL Health and Safety Seminar 19th October 2018 | GPL Construction (UK) Ltd.
GPL’S Health and Safety Seminar welcomed its Subcontractors on 19th October 2018. The aim of this years gathering was to highlight not only the individuals responsibilities for H&S, but for those working around them. 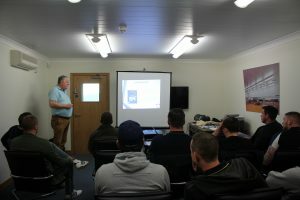 Colin wright MD of Britannia Health + Safety training Ltd delivered the seminar. He discussed topics such as Responsibilities of the Main Contractor, Sub-Contractors and their Employees, Permits to Work, Sentencing Guidelines, HSE- Fees for Intervention and Mental Health. 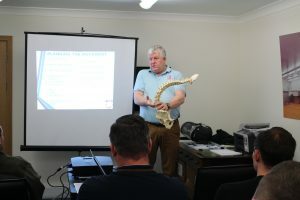 Colin also covered Equipment Inspections including a practical forklift session, Current Legislation, Asbestos Awareness, Training and Qualifications and GDPR. A practical session with the delegates was carried out where they completed a Risk Assessment and Method Statement. In the afternoon the delegates completed Manual Handling Training. Alongside the Health & Safety Seminar other delegates were attending a PASMA / Mobile Tower Course, run by Britannia Safety Training LTD. This is a one day course split into a theory and practical session. Peter Clift MD of GPL said ‘What a beneficial day we had all round. It was good to see so many of the younger lads showing such enthusiasm and knowledge’. This entry was posted in General by Sara Tomlinson. Bookmark the permalink.